Hindus believe in the existence of a supreme God being called ‘Brahman’ who encompasses the whole of existence and everything in it, as well as a creator God ‘Brahma’ and many other gods who have greatly varying attributes. However, despite the huge number of deities worshipped within the Hindu faith it is fully believed that there is only one and true supreme God, ‘Brahman’, his true nature remaining ultimately unknowable to man, prompting the invention of symbolic intermediaries through which Brahman can be worshipped. 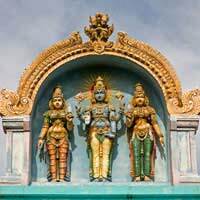 Of the many Hindu Gods ‘Vishnu’ and ‘Shiva’ are the most worshipped of the ‘Supreme Gods’, whilst countless other ‘semi gods’ or ‘angels’ called ‘Devas’ are worshipped on a lesser scale. Hindus believe principally in a cycle of reincarnation, a strict ethical code and ‘Karma’ (the notion that ones actions will come back on them). The aim of a Hindu is to reach a oneness with God through any one of a variety of methods, the eventual achievement of this implying an extinguishment of the self similar to that aimed at by Buddhists. There are many different paths to establishing a ‘oneness’ with God, constituting different forms of Yogic practice, many of which have become popular in the West simply for their health benefits. There are four principle forms of Yoga in Hinduism that aim (respectively) to reach a oneness with God (or Nirvana) through love and devotion, moral servitude, meditation and intellectual inquiry. The form dedicated to meditation, called ‘Raja Yoga’ requires that the individual practice meditation conscientiously whilst maintaining a focus on moral obligations. Whilst ‘Raja Yoga’ is the form of yoga most dedicated to meditation, there is a crossover between this and the other three yogic practices - Bhakti Yoga, Karma Yoga and Jnana Yoga, with each individual free to choose practices from across the yogic forms. The goals of Yogic practice are outlined in the Bhagavad Gita, which is comprised of a selection of texts that are central to the Hindu faith. There are many subsections of Yoga, owing broadly to the four main Yogic practices, such as Kundalini Yoga and Hatha Yoga which like many forms popular in the West aim toward the practice of meditation principally. Raja Yoga, like Buddhist practice has a strong moral element, extending from its belief in the connectedness of all things. By observing sound moral practices and meditating regularly it is believed that the Yoga practitioner can withdraw from the outer world and eventually reach a union with the greater God-Being ‘Brahman’, free of physical attachments or mental associations with this world, called ‘Samadhi’. The actual practice of Hindu meditation is principally the same as many other forms of spiritual meditation, Hinduism having proceeded, as it did, all other widely followed extant spiritual forms. The adoption of postures useful for the channelling of the breath and energy (prana) are frequently blended with the reciting of a mantra (such as ‘Om’ - see related article ‘Meditation and Mantras) and a visualisation of the Chakras (see ‘Meditation and Chakras’). The complete adherence to Hinduism is often not desirable from a Western viewpoint due to its associations with rigid hierarchical social ‘caste system’ in India. However, this is not something one can clearly associate with Hinduism, its practice being culturally dictated as much as spiritually inspired. Additionally, many of the semi gods worshipped by Hindus may be confusing to one wishing to embark upon a spiritual path. However, the Yogic practices associated with Hinduism are central to the practice of many Western persons and turning to the wisdom of this, the oldest of religions can be no bad thing when combined with other elements along you own personal spiritual path.